When to practice: Check your daily schedule for the best time. Try to pick a specific time, set it aside for practicing and stick to it. We all tend to put things off, but once we take the first step we enjoy jumping in. How to practice: The best advice is...Just Do it! When you finish your practice session the satisfaction will come not only from your musical progress, but also from the pride of overcoming procrastination. Have everything ready to go. Your music stand set up, your sheet music, a pencil, your practice sheet, etc. Don't be afraid to use a pencil. Write down questions and circle difficult parts. 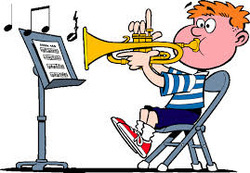 Where should you practice: Try to avoid noisy places. Pick a place where you can concentrate. If there is only one room, discuss the time with your family and ask them to leave the room available for your practice period. If it's the same time each day it will make it easier for them. Your fingers/arms are not naturally designed for playing an instrument just as they aren’t naturally designed to type or text on your phones. We are training your fingers to hit the right key in the right way at the right time. Your fingers will connect with your instrument with practice. Just as you don’t have to look at your computer or phone keyboard while typing, you won’t have to look at your instrument while playing. There is a fancy word for this. It’s called muscle memory. Everything we do is the result of practice. Learning to walk, to hold a pencil, to throw a baseball, to hit the correct button on your video game controller is a result of muscle memory. The cool thing about muscle memory is that we have control over it. We can train ourselves to do what we want. It is an example of how amazing the human body is.